April 28, 2015 – Dr. Matt Nolan, research professor at University of Alaska Fairbanks, utilizes Analytical Graphic, Inc.’s (AGI) Cesium platform to display high resolution, 3D topography mapping environmental changes in his web-based, custom globe, FodarEarth. Dr. Nolan has logged 50,000 miles over Alaska, mapping topographic change on the centimeter level, and has amassed almost a terabyte of imagery and terrain data, including mines, glaciers and environmentally sensitive areas. His company, Fairbanks Fodar, uses a cutting edge photogrammetric method which turns his aerial photographs into topographic maps to better understand the impacts of climate change in Alaska, and provides mapping solutions for entities including the National Park Service, USGS, Alaska Department of Fish and Game, Alaska Department of Transportation, and National Geographic. In order to bring this huge data set to the public, AGI’s team implemented the Cesium services that leverage Amazon Web Services (AWS) as a mechanism to store, process and host all of Dr. Nolan’s data. The processed imagery and terrain is served as WMTS imagery and quantized mesh terrain services, which the Cesium services layer into FodarEarth. “When we first got involved with Dr Nolan, we saw that Cesium was an obvious choice because of the super high resolution terrain and 3D visualizations his work required,” says Todd Smith, AGI director of geospatial technology. Dr. Nolan hopes that his methods will bring awareness to politicians, land managers and community at large of how dynamic the earth’s surface is and how valuable such information can be to them. The next step for the Fodar – AGI partnership is to display a time-series of topography to measure and visualize changes. 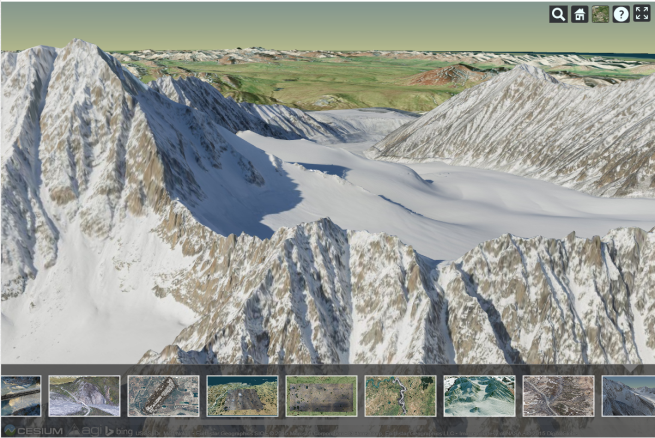 Cesium provides time-based geospatial 3D visualization in a browser without a plugin. Analytical Graphics, Inc. (AGI) is the incubator of the Cesium team and is the founder and primary contributor to the open source project. The Cesium team also builds off the shelf software products to enable the rapid dissemination of geospatial data.